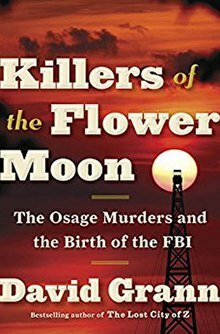 Killers of the Flower Moon: The Osage Murders and the Birth of the FBI by David McGrann investigates a series of murders of wealthy Osage people that took place in Osage County, Oklahoma in the early 1920s—after big oil deposits were discovered beneath their land. Officially, the count of the murdered full-blood wealthy Osage native Americans reaches at least 20, but Grann suspects that hundreds more may have been killed because of their ties to oil. The book reports cattleman William Hale as the mastermind standing behind the murders and presents detailed evidence. In the 1890s, the Osage had been decanted from homelands in Kansas into seemingly barren wastes in Oklahoma. The discovery of ­hydrocarbons beneath, however, shortly made them the richest people per capita in the world, occupying, as Grann puts it, America’s first ‘‘underground reservation’’. Not everyone was so ingenuous. If misfortune should befall an Osage partner, potential rewards multiplied. The official death toll of the ‘‘Reign of Terror’’ is something in the order of 60. Unofficially, Grann suggests, it is incalculable. A staff writer for The New Yorker, he concentrates on only one of a host of conspiracies, an investigation of the vendetta against the family of one Mollie Burkhart, engineered by cowboy turned ‘‘high-class gentleman’’ Bill Hale, who was at first, ironically, perceived as a sympathiser with the Osage.